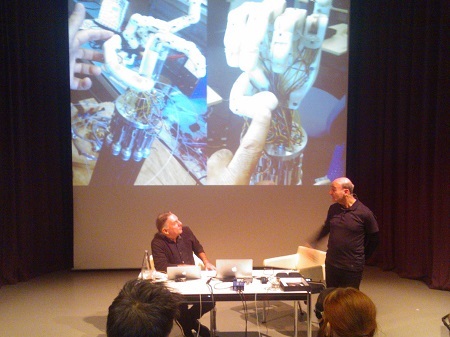 Friday 25th.October, the New Institute Rotterdam; a 3-hour seminar by artist Stelarc and philosopher Henk Oosterling as part of the exhibition Biodesign. Despite several attemps by Oosterling to try to get past the issues of art as such the whole afternoon remained somewhat one-sided. Connecting technological developments to art while some of them have possibilities in society is declaring art as individual statement – no problem there – while disregarding its enhancive options in society. But fascinating it was: growing an ear on one’s arm.